The Festival has been a hidden musical gem known only by the world’s best soloists, conductors and orchestral musicians, the residents of Jackson Hole and its visitors—until now. Building on a successful multi-year partnership with Performance Today, the Festival is embarking on its first national radio series to further share its breathtaking music making with audiences around the country. Maestro Runnicles, hailing from Scotland, has a career spanning many continents, both in the opera house and on the symphonic stage. He currently serves as General Music Director of the Deutsche Oper Berlin and Principal Guest Conductor of the Atlanta Symphony in addition to being Music Director of the Grand Teton Music Festival. He formerly served as Music Director of the San Francisco Opera for 16 years. With delightful tales and musical anecdotes from his storied career, Runnicles serves as host the of the program. He shares the mic with Andrew Palmer Todd—former public radio host, classical pianist and current CEO of the Festival. Together they bring your audience music making at its best, from the Grand Teton Music Festival. 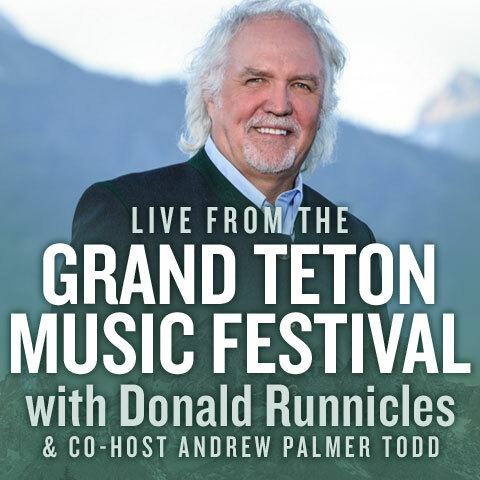 The inaugural season of Live from the Grand Teton Music Festival, a new production of Classic Digital Syndications, will be available January 1, 2019 on PRX and from the CD Syndications website. The series consists of 13 one-hour programs, which are available free of charge to your station.